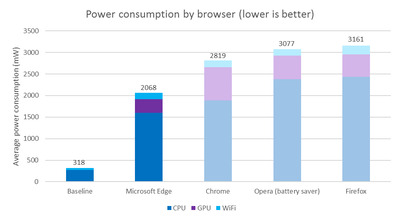 The ubiquitous Google Chrome web browser is great, but it’s long been known to be a battery hog. Now, Microsoft is taking aim at Chrome’s weak spot. In a blog entry posted today, Microsoft is boasting that the Edge browser that comes with every copy of the new Windows 10 operating system gets you as much as 70% more battery life than Google Chrome and 43% as much battery than Firefox on a laptop. 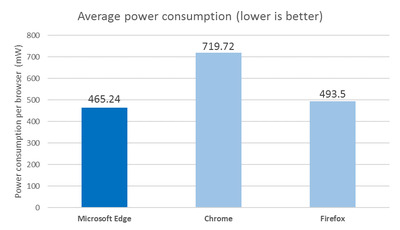 Previously, Microsoft had claimed that Edge was 112% faster than Chrome. Microsoft may be winning the battery life battle, per these results which were independently corroborated by The Wall Street Journal. And the company promises that Edge is getting even more battery efficiency improvements with the Windows 10 Anniversary Update, coming later this summer. That update also adds browser extension support for tools like password management app LastPass to Edge. But Edge is still losing the browser war: Despite the fact that it comes with all of the 300-plus million Windows 10 installations out there, the latest data from tracking authority W3Counter places the combined marketshare of Microsoft’s Edge and Internet Explorer browsers at a meager 10.3% — versus Chrome’s 58.7%. Meanwhile, the race for better batteries goes on: Microsoft itself has an ambitious plan to build batteries that last much longer than the laptops we’re used to.